Jeremy casts spells in-between his careers as a chemical analyst and campus manager. How Do Planeswalker Cards Work in Magic? Planeswalkers are one of Magic's most engaging card types, as they offer ongoing effects that can make or break your match. 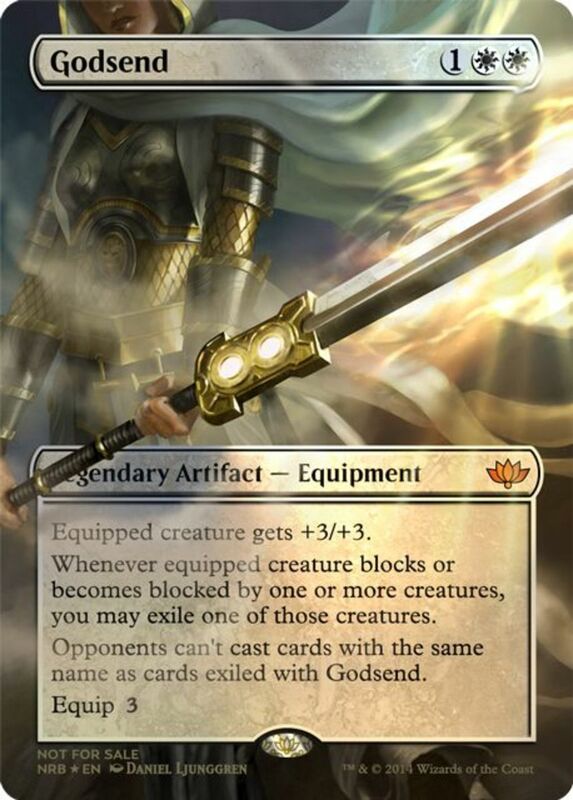 Planeswalkers generally demand a substantial amount of mana, arriving with a number of loyalty counters (shown in their bottom-right corner) used to fuel their effects. For each planeswalker you control, you can only use one ability per turn, and it'll add or subtract a listed amount of loyalty. If your opponent successfully damages a planeswalker, they'll lose loyalty equal to the attacker's power, so be sure to guard your allies with sturdy creatures. With over a hundred planeswalkers, we have many powerful companions to choose from, but some stragglers are better ignored. To help diversify the list, we're only taking one of each named planeswalker (one Vraska, one Chandra, etc. ); without further ado, here are the ten worst planeswalkers in Magic: The Gathering! 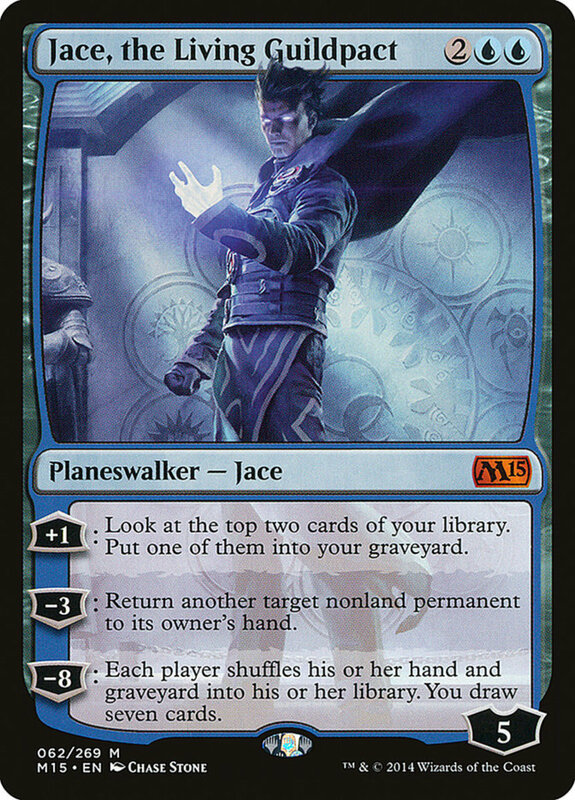 Most of Jace's numerous forms rank among the best planeswalkers available, but his Guildpact rendition sadly disappoints. Things start off looking good, as he needs just four mana and arrives with an impressive five loyalty, but he wields a sluggish +1 that lets you look at the top two cards of your deck and place one into your graveyard. Unlike many blue loyalty-adding effects, this does nothing to increase your hand size, and simply isn't as useful as you'd like. -3 bounces a nonland permanent back to its controllers hand, and -8 shuffles all cards from hands and graveyards into the deck, then lets you draw seven cards. Both are decent, but since Jace can only gain a single loyalty each turn, you'll rarely be able to make good use of them, and there's little reason to choose Guildpact over Jace's excellent "Unraveler of Secrets" or "Mind Sculptor" forms. 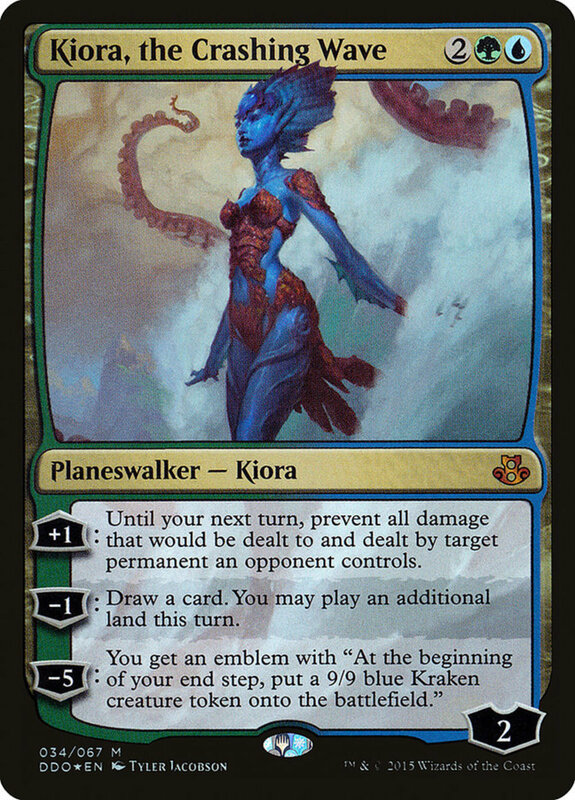 Green/blue Kiora also only requires four mana, but arrives with a stupendously low two loyalty, making her vulnerable to instant death at the hands of a "Lightning Bolt" removal. Compounding the problem, she can only gain one loyalty at a time, and her +1 isn't great, preventing all damage that would be dealt to and by an opposing permanent until your next turn, stalling but also shielding them. 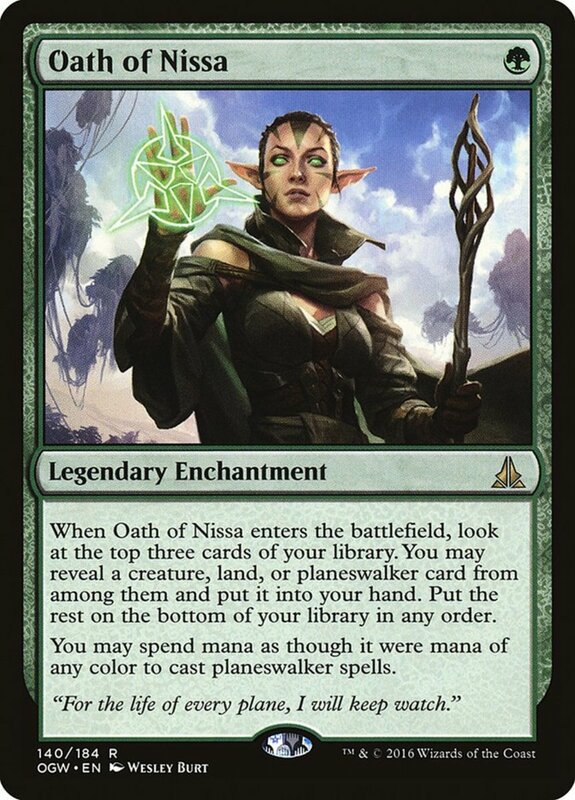 Kiora's biggest benefit is her nice -1, which only subtracts one loyalty and lets you both draw and play an extra land that turn. Ultimate -5 places a 9/9 kraken token during your end steps, but you'll very rarely be able to afford it. Overall, Kiora's -1 could redeem her if only she arrived with more starting loyalty; as is, you should instead utilize her "Master of the Depths" form instead. Still, for what it's worth, Crashing Wave's a remarkably inexpensive unit, costing less than three dollars (a bargain for a planeswalker), and I've used her in a few budget decks. 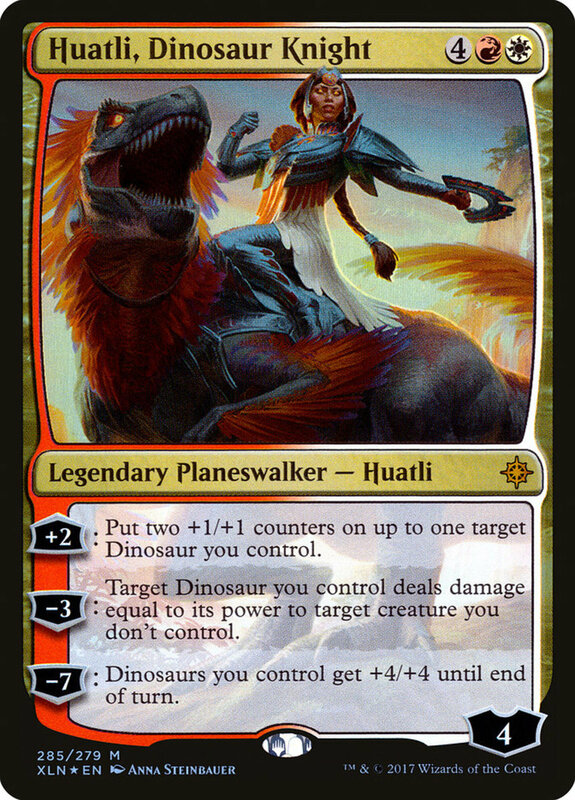 Huatli needs a substantial six mana yet only arrives with a lackluster four loyalty counters, and she's very dependent on having dinosaur-type cards fielded. That said, her additive +2 trait gains two loyalty at once and places two +1/+1 counters on a dinosaur you control. That's a decent effect, but it relies on both playing and controlling dinosaurs, and isn't much help after suffering a field wipe. Her other effects are similarly dependent. -3 has a dinosaur you control deal damage equal to its power to another creature (essentially giving a fight without getting hit back), a fair but not overwhelming effect. -7 offers a pathetic ability that only grants your dinosaurs +4/+4 for a single turn, neglecting the game-long emblems or outrageous effects that most ultimates provide. 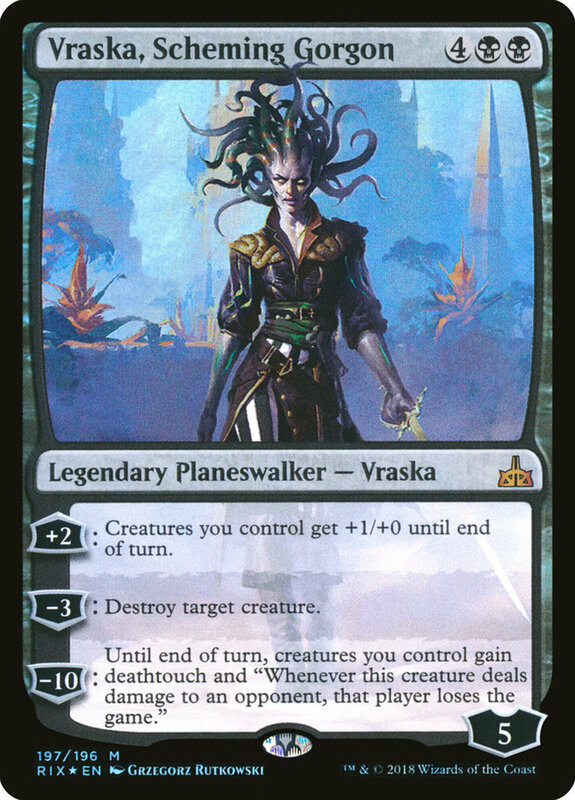 Black's Vraska demands six mana and arrives with a medicore five loyalty. She can gain two at once with her +2, but this only grants your creatures +1/+0 for the turn, an underwhelming boost for such a late-game card. -3 destroys a target creature and, for a single turn, -10 grants your creatures deathtouch and the ability to inflict an instant loss when they damage an opponent. Both are alright, but just can't compensate for Vraska's high price and dull +2. Try her "Golgari Queen" or "Relic Seeker" editions instead. 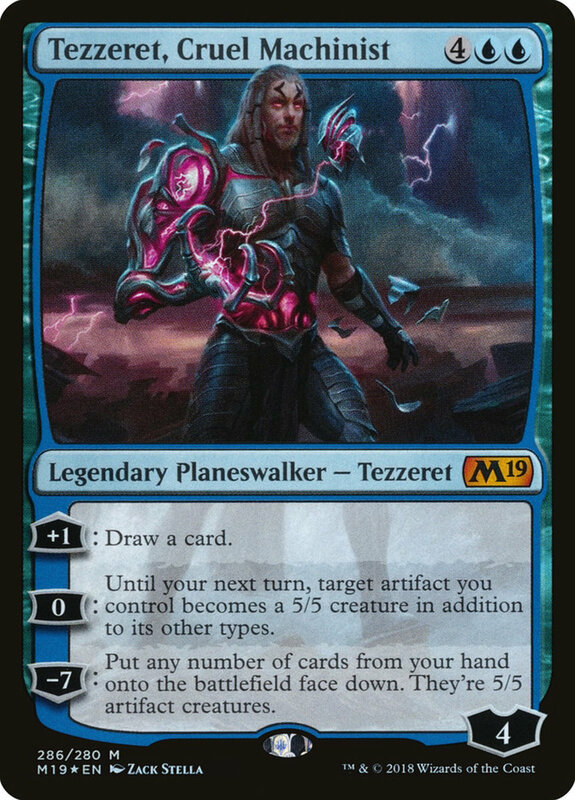 Yet another six-cost planeswalker, Tezzeret arrives with a frail four loyalty. 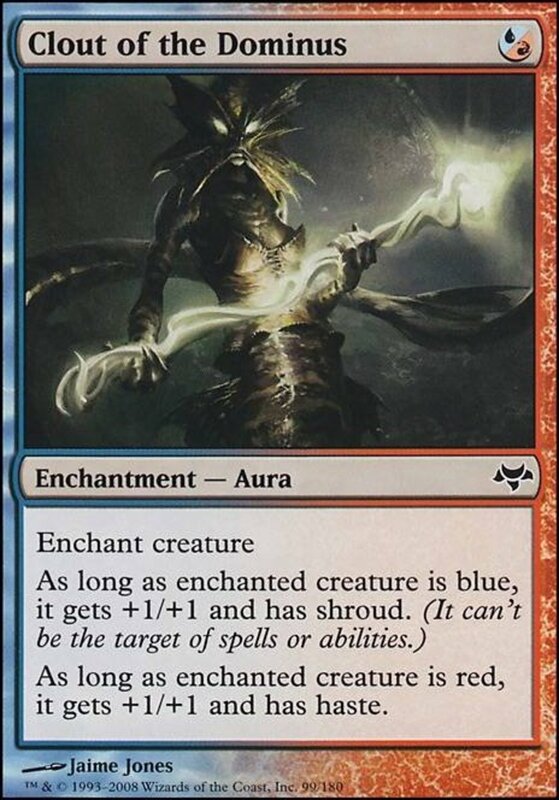 His +1 simply draws a card, which is nice, but available on cheaper and less expensive blue planeswalkers. Meanwhile, +0 turns an artifact you control into a 5/5 creature for the turn. Those are strong battle stats, but remember that adding additional types to your cards makes them vulnerable to different types of removal, so you're risking death with this ability. -7 places any number of cards from your hand face-down onto the field as 5/5 artifact creatures. An atrocious ultimate, as it not only reduces your hand, but doesn't grant your creatures haste, meaning they'll still have to wait a turn to attack, which (especially in the late stages of the game) can mean the difference between victory and defeat. Try Tezzeret's "Schemer" and "Seeker" forms instead. Due to their high-cost natures, planeswalkers tend to prefer the longer matches of commander format. However, the speedy red faction is better suited for a quick win than a lengthy match, and it's always struggled to utilize planeswalkers effectively. 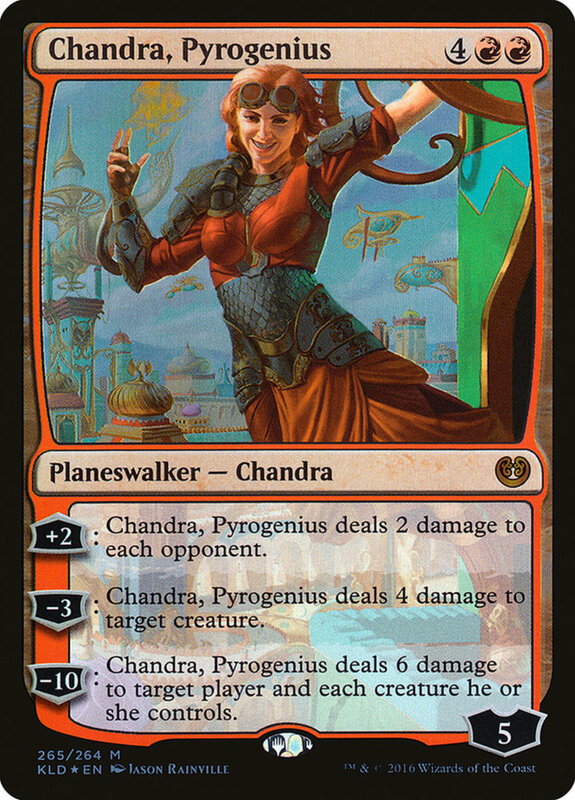 Thus, I'm only fond of a few Chandra planeswalkers, like her "Torch of Defiance" mode. Pyrogenius needs six mana and arrives with just five loyalty. Her +2 gains two loyalty at once, but it's pretty weak, hitting each opponent for just two damage (which is even worse in 1v1). -3 deals five damage to a creature, not even a guaranteed kill. Ultimate -10 smashes an opponent and all their units for six damage, a brutal effect but not enough to save Pyrogenius from her other disappointing traits. 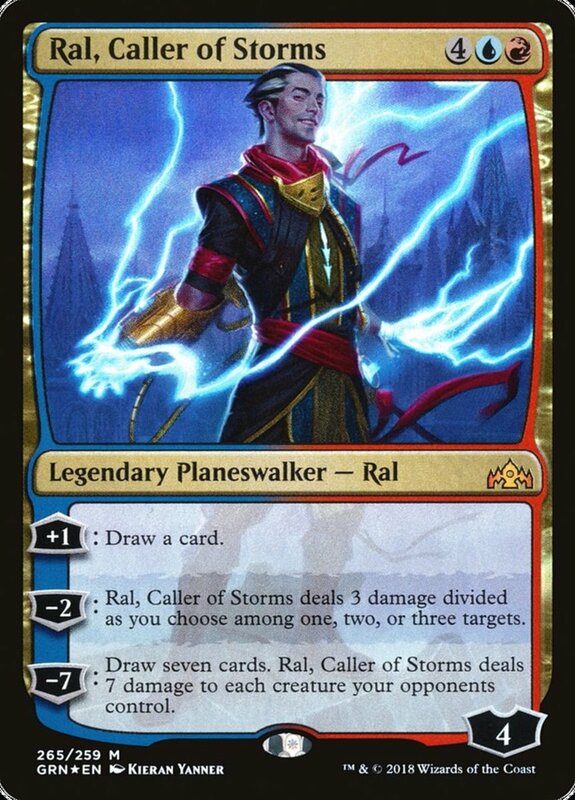 Ral shares many of Tezzeret's attributes, draining six mana yet arriving with just four loyalty. His +1 is a simple draw, which is still nice but better utilized on cheaper alternatives. -2 deals three damage among 1-3 targets; it's nice that you can spread it out, but the overall pain inflicted isn't anything impressive. Ultimate -7 draws seven cards and deals seven damage to all opposing creatures, a fair boon but not enough to compensate for Ral's failings. From his mana cost to his initial loyalty to his effects, nothing Ral has really shines, and his requirement of two mana types further explains his lack of usage in competitive matches. 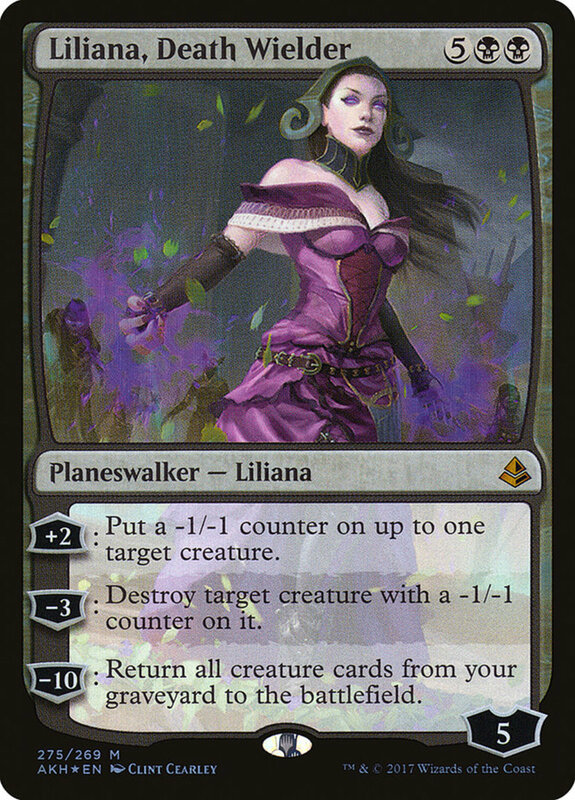 Liliana's Death Wielder form is just way too expensive for her limited powers. Seven mana for a five loyalty troop means she better wield some devilishly good effects—which she doesn't. +2 simply places a -1/-1 counter on a creature. -3 destroys a unit with a -1/-1 counter, which stacks with her first ability, but is subtracting three loyalty from a planeswalker this expensive really worth eliminating a troop that you already spent time weakening? Ultimate -10 returns all creatures from your graveyard to the battlefield, which can be pretty useful if you've been milling zombies or other cards from your library, but even this trait doesn't combo with Liliana's previous effects. Unless you've been destroying your own cards (and why would you? ), she annihilates enemy creatures, which won't do anything to support her -10 revival of your soldiers. Expensive and weak, Death Wielder is far outperformed by Liliana's "Veil", "Last Hope", and "Dark Realms" entries. Tibalt is the game's cheapest planeswalker, needing only two mana, but his effects are lacking even considering his price reduction. His +1 draws a card, then discards one at random, meaning your overall hand size doesn't improve and you don't even get to choose what to toss. -4 isn't much better, dealing damage to a player equal to the card in their hand, an expensive play that usually only nets 1-3 damage by the time you can afford it. 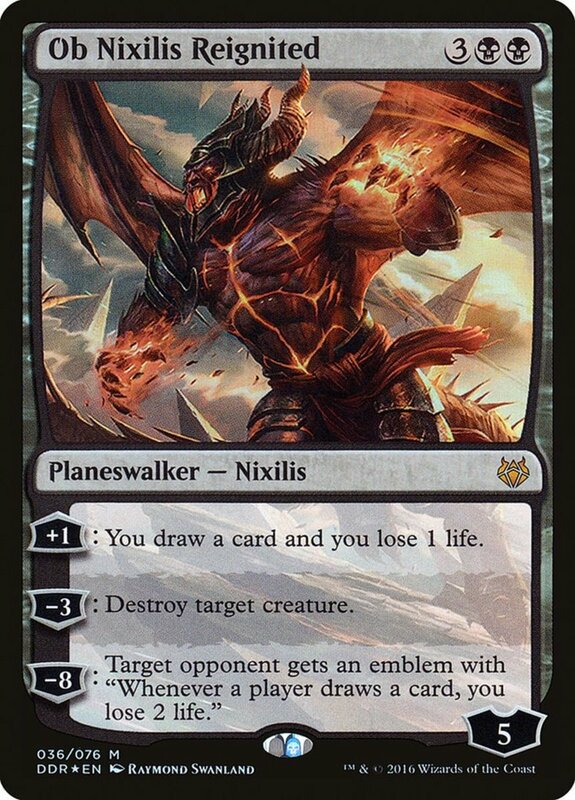 Ultimate -6 is better, gaining control of all creatures until the end of the turn, untapping them, and granting them haste, but keeping Tibalt alive long enough to use it isn't easy, and there are better ultimates you can harness at faster speeds. 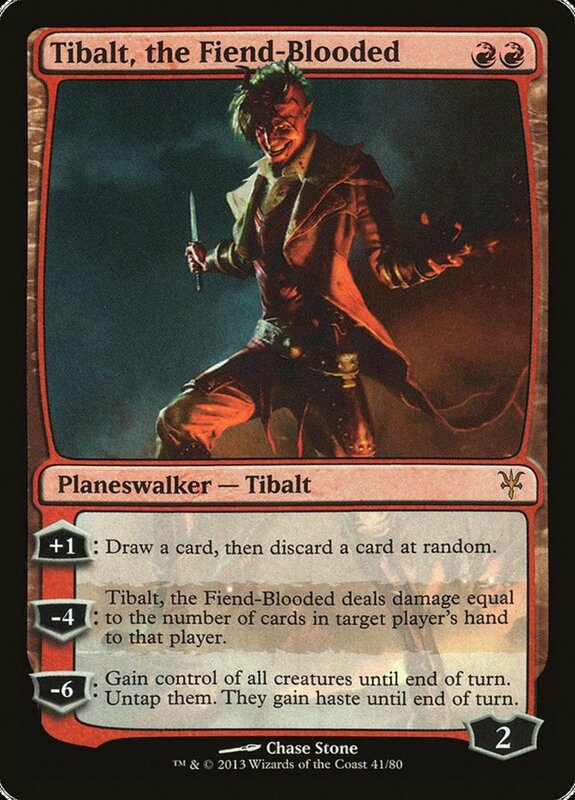 Honestly, Tibalt receives more hate than he warrants, as I occasionally use him to stock my graveyard and absorb three damage, but he's far from my favorite planeswalker. And for what it's worth, he's inexpensive compared to his peers, costing well under three dollars. Target player puts the top ten cards of his or her library into his or her graveyard. Create X 2/2 white Cat creature tokens, where X is your life total. Target player sacrifices two creatures. Exile all cards from target player’s library, then that player shuffles his or her hand into his or her library. Add X mana in any combination of colors to your mana pool, where X is the number of creatures you control. Destroy target creature. You gain life equal to its toughness. Put all creature cards from all graveyards onto the battlefield under your control. Where do I even begin with Uzra? First, he needs all five colors, meaning he's unavailable to most decks and even for those that possess the hues, you run the risk of drawing the wrong land types. Then, he only enters with four loyalty despite his cost of five mana. 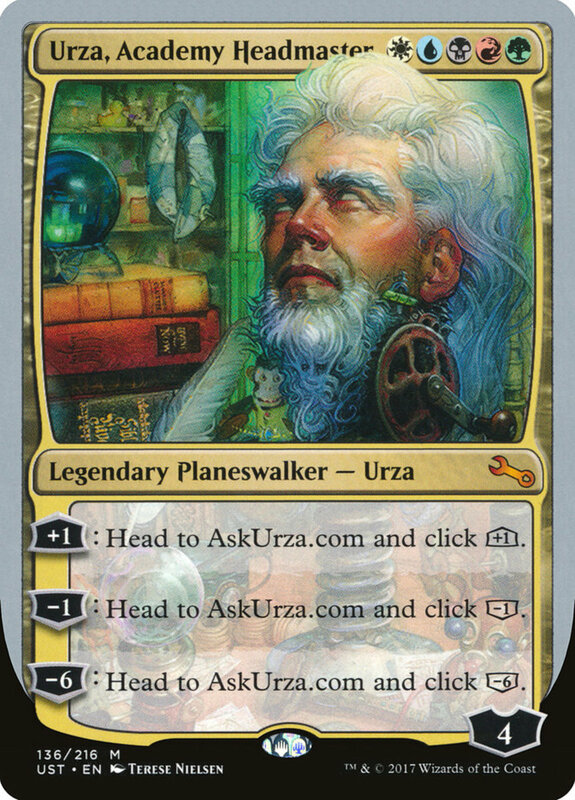 As if that weren't enough, each of his three effects (+1, -1, and -6) requires you to go to "AskUrza.com" and click a button to receive a random effect taken from a different planeswalker. Thus, not only is your game slowed with the inconvenience of finding a website, you never quite know which of Uzra's effects you'll receive, making him unpredictable and hard to build around. As a final nail in the coffin, he belongs to the gray-bordered Unhinged expansion, disqualifying him from most official events. Not that you'd really want this slouch in them anyway. Which card is your least favorite? Don't feel too bad for these saps, as most wield far-superior forms to keep their names relevant. 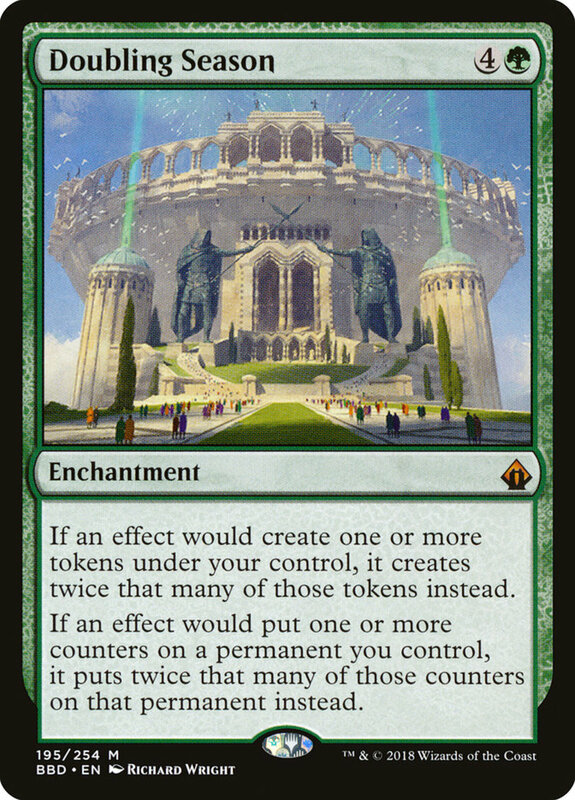 And whether using today's jokers or their better alternatives, you can support planeswalkers with cards like the enchantment "Doubling Season", which lets them enter with twice the loyalty, or "Atraxa, Praetors' Voice", whose proliferate adds an extra loyalty counter at your end steps. Despite a few duds, planeswalkers remain an engaging and prominent spell type that fans continue to love, as they make you feel like you have an actual ally in battle whose abilities progress as the game continues. But for now, as we eagerly await Wizards of the Coast's next set of powerful planeswalkers, vote for your favorite card and I'll see you at our next MTG countdown! Top 10 Magic: The Gathering Planeswalkers to Combo With "Doubling Season"